During the next 20 years we will witness a major shift from vehicles that are mostly mechanical to vehicles that are primarily electronic. The success of hybrids heralds this new era. Electric motors are replacing internal combustion engines. In the parlance of technology, we could call this Car 2.0. The transition to Car 2.0 is complicated. Current batteries are not sufficient for all vehicle uses. Hybrids, plug-in hybrids, and hydrogen fuel cells will compete in extending the range and performance of vehicles with electric drive systems. The engines in these vehicles will be next generation biofuels blended with petroleum fuels. Slowly but surely, electricity will replace most petroleum fuel. The source of the electricity is in transition as renewable energy replaces coal-powered generation of electricity. A smart grid will increasingly deliver solar and wind power from remote locations to the hearts of our cities. We are also witnessing more than Car 2.0; we see the beginnings of Transportation 2.0. In 2008, use of rail and public transit set records as Americans drove 100 billion less miles than in 2007. 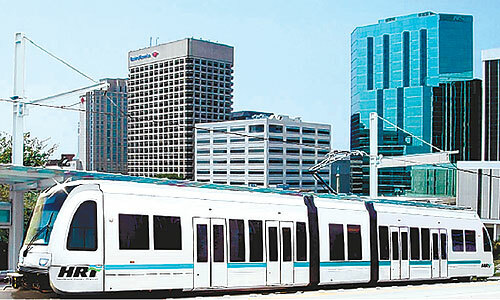 Modern cities use electric powered light-rail. In the future much of those cities will be connected with the electric-powered high-speed rail that is common in Europe and parts of Asia. Five million new jobs can easily be created in building electric vehicles, expanding public transportation, connecting our great nation with high-speed rail, installing solar power, wind power, other renewable energy, and building a network with smart grids. To create these jobs, however, a smaller number of jobs will be lost as fewer low-mileage vehicles are built, as electric components replace mechanical, and as renewables replace fossil fuel. More will be required than the $17 billion provided at the end of 2008; needed is vision and a will to change. The transition to Transportation 2.0 will not be smooth; it will not be pretty. Some corporations, jobholders, and special interests tied to old paradigms will continue to fight change and continue to sue states that try to regulate greenhouse gas emissions. Unfortunately, this will be a squandered opportunity for those corporations to be global leaders and to be job creators. As this book goes to press, the auto industry is in a great transition. The future will be bright for those that seize the opportunity to lead in Transportation 2.0. Because automakers are financially challenged, some of the new vehicles, which are discussed, will not come to market. Some will not make it into production. Yet many exciting new vehicles will be in your immediate future. The solutions are here. They are described in the chapters that follow.